Verizon took the wraps off a new pay-as-you-go data feature today called PopData that could be a decent option for those with small data buckets who need to access a bunch of data while on the go. They don’t seem to have pushed out an announcement, so that could be coming with additional details. 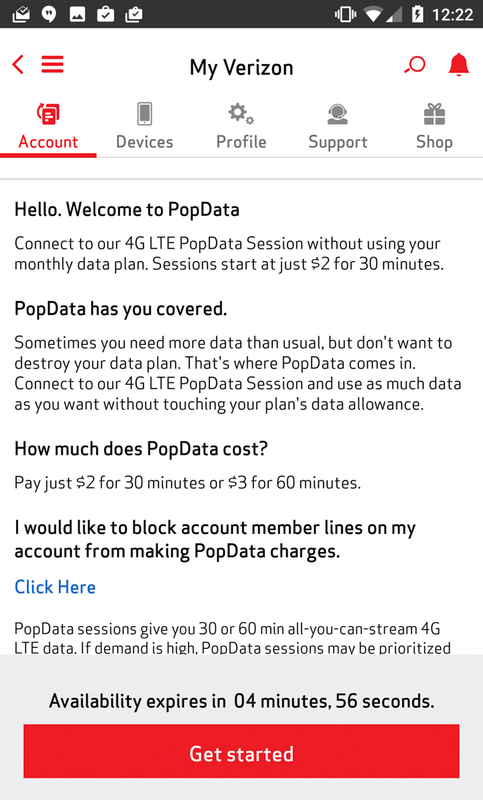 However, as of now the PopData site is live (as is the option in the My Verizon app) and it gives us a pretty good description of how this new data option works. 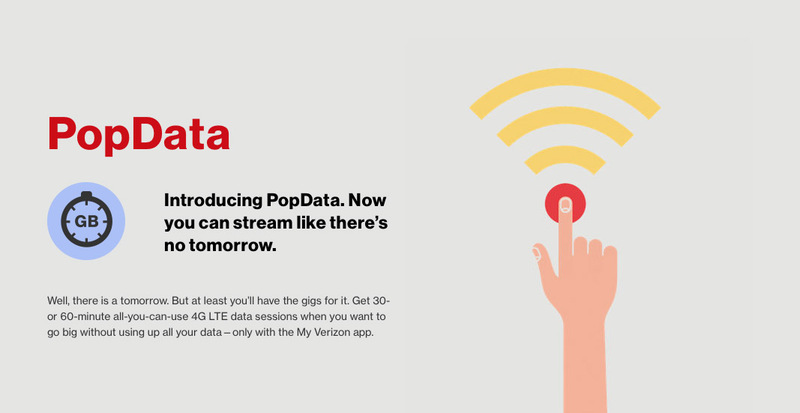 With PopData, Verizon is giving customers a data option that lets them pay for a short session of 4G LTE data use that won’t count against their data plan. The theory here is that you may need to download a movie (or a few movies) or other heavy files, but your data plan may not have enough left or you don’t want to gobble it all up long before your billing period ends. 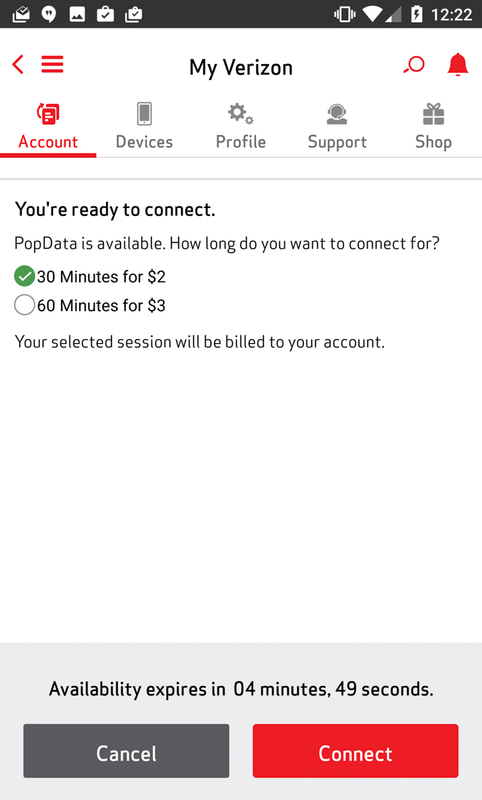 Should you choose to use a PopData session, you could get all of those downloads in within 30 or 60 minutes and then be back on your normal data plan. It works like this. You open the My Verizon app, scroll to the bottom to find the PopData button, tap on it, see if a PopData session is available, and then decide how long you need your PopData session to be. As of today, Verizon is offering 30 minute sessions that cost $2, or 60 minute sessions that cost $3. 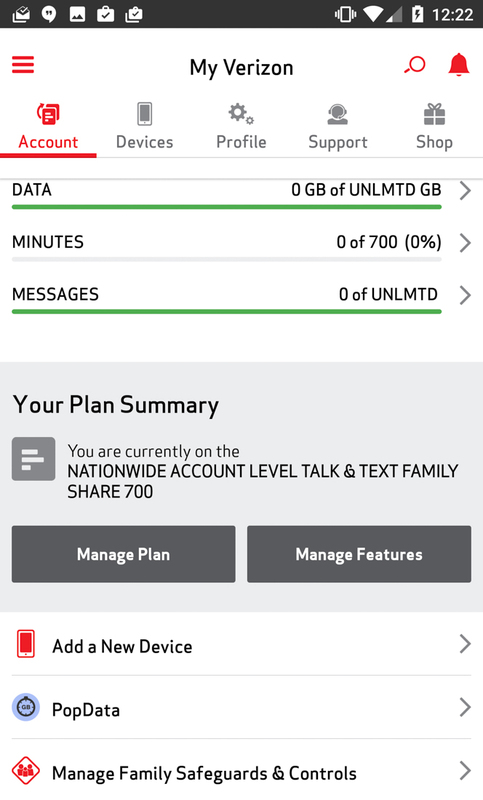 During those sessions, you can use as much data as is possible and it won’t count against your data plan. And that’s it. It’s that simple. Verizon is selling this as a way to get more data while you travel, while maintaining great download speeds and avoiding unsecure (or sh*tty) public WiFi hotspots. So who can use PopData? According to Verizon, PopData is available to Android smartphones, iPhones, and iPads. In other words, it’s not available to hotspots, from what I can tell, nor is this a short-term tethering option. Also, you can’t always just jump into a PopData session if Verizon determines that the network in your location is struggling at the moment. You can read the rest of the FAQ at the links below.